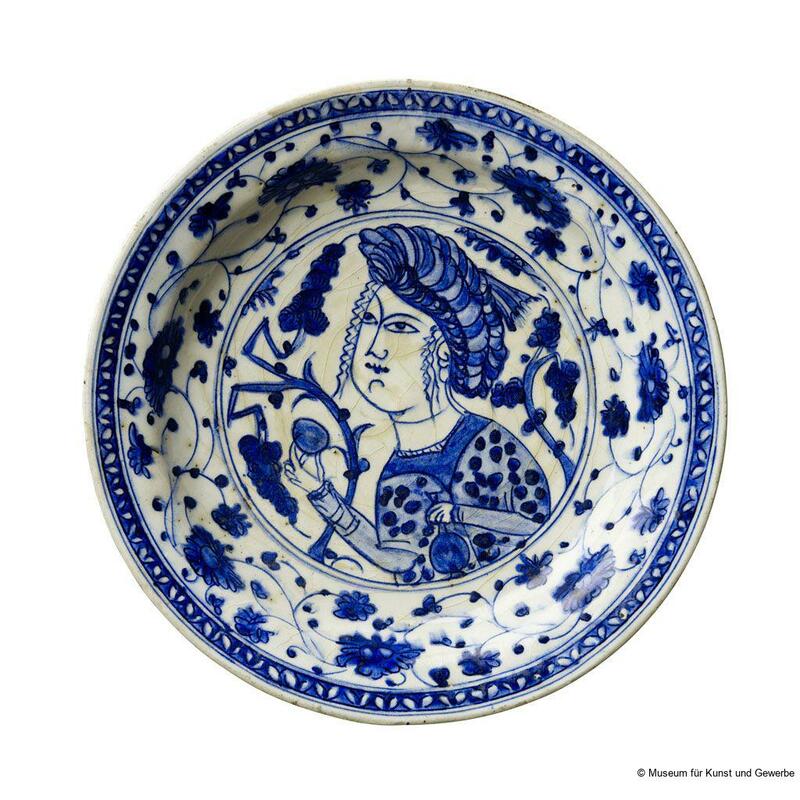 This typically Persian motif on this plate is of a dreamy young man in front of a grapevine holding a wine bottle and a drinking bowl. The string of the flowers on the edge imitates the Chinese porcelain. In 1502, Safavids made themselves independent of the Mongols and resided in their new capital, Tabriz in western Iran (the centre of the Mongolian empire was located in the Eastern Iran). The old trade relations with China persisted and were even expanded. Apart from many written testimonies, two large collections of Chinese porcelain confirm their high value at that time: Shah Abbas Mosque in Ardebil, Iran (sanctuary of his family) as well as Sultan's Palace, Serail in Istanbul. This plate is Kubachi ware, the name given to a particular group of underglaze painted pottery that includes a large number of vessels and some tiles, probably destined for palaces. They are thought to have been produced in north-western Iran, probably in the vicinity of Tabriz, between the fifteenth and seventeenth centuries. Porter writes: "the name comes from finds of this pottery in the village of Kubacha in Dagestan in Caucasus by a Russian scholar at the end of the nineteenth century. There are several groups of Kubachi ware, including vessels with decoration largely derived from blue and white Chinese porcelain of the fourteenth to fifteenth century. 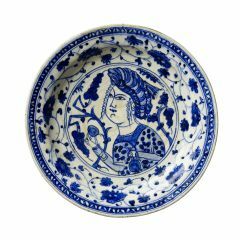 Kubachi ware frequently contains figural designs, including languid figures similar to those in contemporary Persian miniatures." Gray, Basil, Studies in Chinese and Islamic Art, Volume II: Chinese Ceramics and Islamic Art, United Kingdom: Pindar Press, 1987: 23-30. Jakobsen, Kristian, Islamische Keramik, Hamburg: Bilderhefte des Museums für Kunst und Gewerbe Hamburg, 1959. Kraft, Eva (ed), Die Campe’sche Historische Kunststiftung Hamburg. Erwerbungen seit 1945, Hamburg: Hoffmann und Campe, 1964: 73, Nr. 222.